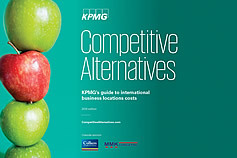 Competitive Alternatives represented KPMG's guide to international business location costs in North America, Europe and Asia Pacific. MMK Consulting is proud of our long association with this study, from 2001 through to 2018, having managed many aspects of the Competitive Alternatives study process on behalf of KPMG. MMK Consulting was formed in 2001 by a team of professionals formerly with KPMG Consulting. Our professional staff each have more than 25 years of consulting experience, with a variety of education and experience in a range of industries and sectors. MMK Consulting's objective is to provide our clients with the highest level of professional service, to ensure complete satisfaction on every project we undertake.